Explanation: Yesterday, a comet passed very close to Mars. In fact, Comet C/2013 A1 (Siding Spring) passed closer to the red planet than any comet has ever passed to Earth in recorded history. To take advantage of this unique opportunity to study the close interaction of a comet and a planet, humanity currently has five active spacecraft orbiting Mars: NASA's MAVEN, MRO, Mars Odyssey, as well as ESA's Mars Express, and India's Mars Orbiter. Most of these spacecraft have now sent back information that they have not been damaged by small pieces of the passing comet. These spacecraft, as well as the two active rovers on the Martian surface -- NASA's Opportunity and Curiosity -- have taken data and images that will be downloaded to Earth for weeks to come and likely studied for years to come. 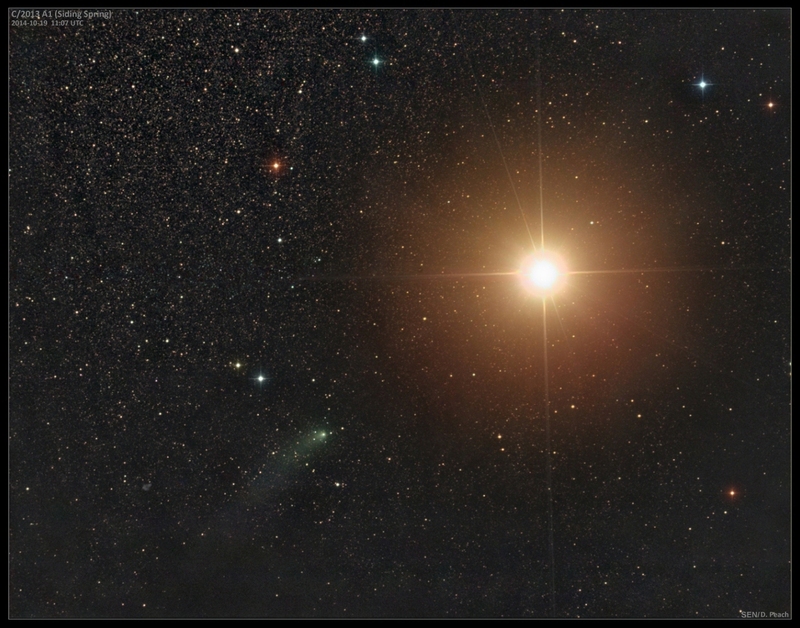 The featured image taken yesterday, however, was not taken from Mars but from Earth and shows Comet Siding Spring on the lower left as it passed Mars, on the upper right.